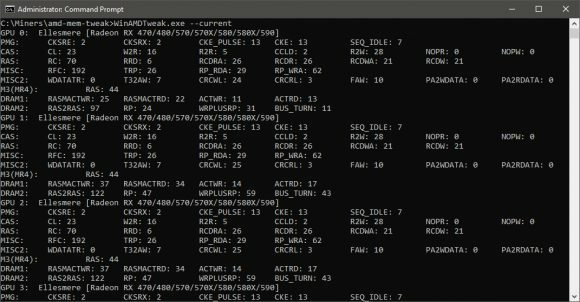 The very useful AMD Memory Tweak Tool that was initially only available for Linux is now also available as a beta for Windows users as well. With the help of the free and open source software from Evilop you can read and modify memory timings “on the fly” for compatible AMD GPUs that do come with GDDR5 or HBM2 memory (HBM was also supported initially, but is temporary disabled as it apparently need some fixing). 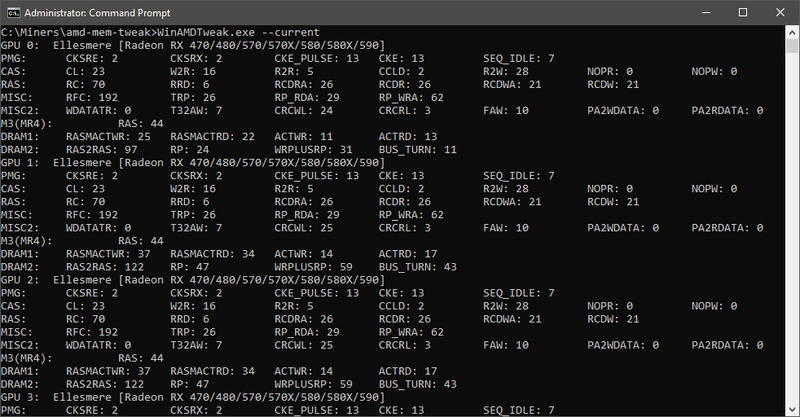 Before starting to do anything with the tool you should check the Readme and run AMD Memory Tweak with the option --current in order to see what GPUs it detects and what memory settings are currently active. It might also help to see what other users have found out as good working configurations for their hardware and have reported on Bitcointalk based on their experiments with the memory tool. Litecoin (LTC) has been doing pretty well lately and no wonder that with the returning user interest in one of the oldest altcoins out there, ASIC manufacturers are also trying to attract new customers for their improved mining hardware. Here comes the new Innosilicon A6+ LTC Master ASIC miner wth PSU included promissing 2.2 GHS Scrypt hashrate at 2100W of power usage ready for shipping at a price of $3000 USD (or 0.613874 BTC or 45.034 LTC with the current prices). Innosilicon A6+ is an enhanced version of last year’s Innosilicon A6 LTC Master with improved performance and energy efficiency. The new Scrypt ASIC miner almost doubles the hashrate with just half of the power usage increase and it is interesting to note that Innosilicon still sells the old A6 miner at a price of $2000 USD without PSU for 1.23 GHS hashrate with 1500W power usage (significantly less than the initial price of $6300 USD it had when announced). Unfortunately running the numbers for the new miner through an LTC mining calculator, while profitable, the profit you can currently get over the power cost isn’t really attractive to really make you want to pull the trigger and get the miner. 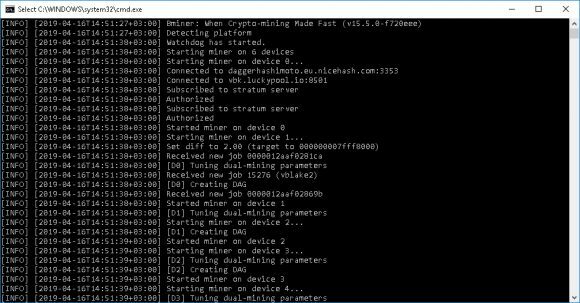 The latest Bminer 15.5.0 comes with another interesting dual-mining feature that has attracted our attention, namely dual-mining Ethereum (ETH) and VeriBlock (VBK), meaning that you can mine any Ethash coin together with the vBlake2 algorithm used by VBK. The new version also comes with improved performance of the Cuckatoo31 algorithm and added parameter -version to output the current miner version and exit. What we were most interested in the new version was the support for VBK (no standalone support for the algorithm yet), so only dual mining Ethash and VBK for now. We wanted to see what performance we can expect in this dual mode from VBK as we already know what to expect regarding Ethash hashrate. Unfortunately it seems that VBK support really does need some more work as the miner is somewhat unstable when dual mining and crashes from time to time and results are also erratic. With OhGodAnETHlargementPill running we were not getting any accepted shares for VBK, only stales, and with the Pill software not running it seems that VBlake2 shares are properly submitted. 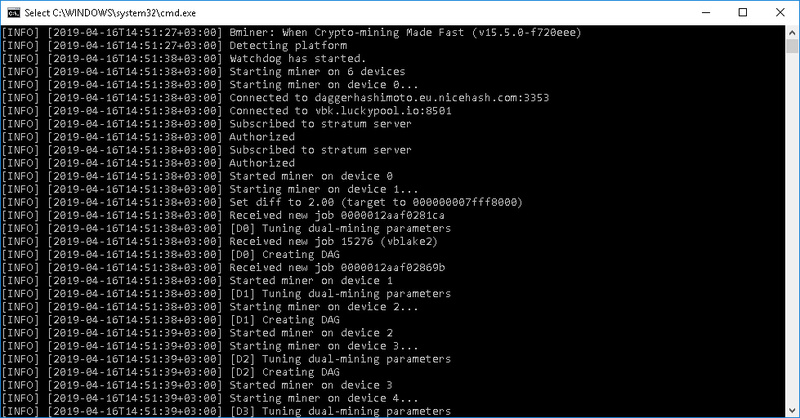 It is hard to understand however what is the exact hashrate for each of the two algorithms when dual mining, so more work is required on that new feature apparently. We remind you that that Bminer is a closed source Nvidia GPU miner available for Linux and Windows in the form of pre-compiled binaries and that there is a 2% development fee for Grin, Beam, Bytom (BTM), Equihash and Zhash coins, 0.65% for Ethash and 1.3% for dual mining Ethash and Blake.